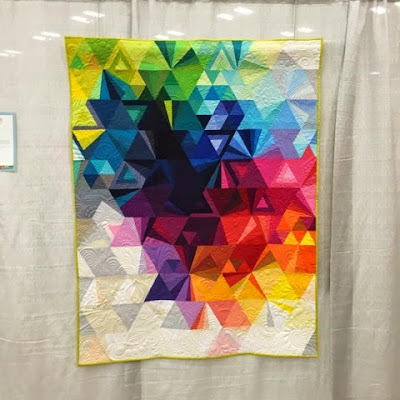 QuiltCon. Even the name sounds modern. So I was expecting lots of young, hip women with pink and purple hair sporting lots of tats with fingers flying as they sent out tweets on their phones. 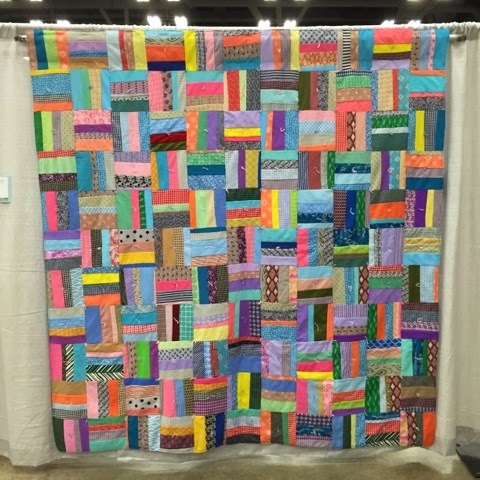 What I got was a convention center full of women (and a few men, even my husband!) 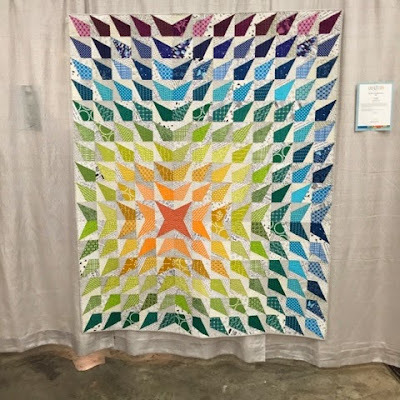 of all ages coming together to ohh and aww at a room full of quilts - almost like every other quilt show I've attended. Almost. Yes, there was an occasional brightly-colored hairdo and a few tattoos. There was even a tattoo booth where people could get a new piece of body art! 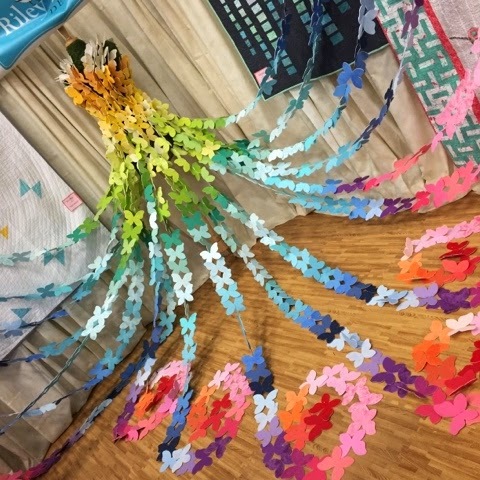 Many of the trade booths were showing how modernly techy they were by holding contests encouraging attendees to post selfies on Instagram for prizes. But I also saw a bus-load of quilters sporting their gray hair and feeling just as modern as those 20-somethings that were toting babies around. 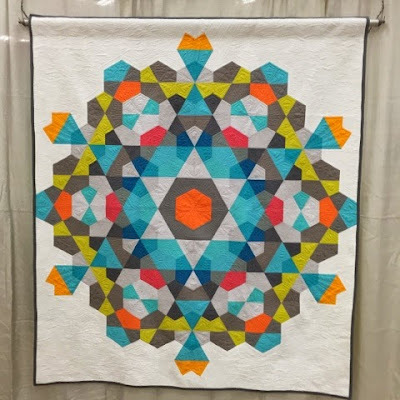 Just as I suspected - Quilters come in all shapes, sizes, ages and walks of life. 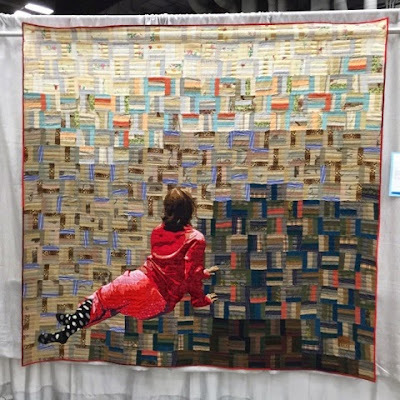 QuiltCon was a four-day event that featured classes, lectures and workshops from a variety of quilters, plus a vendor and quilt show. 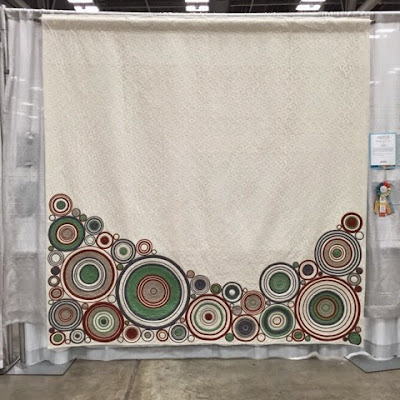 Since I didn't really know if I'd get to work this into our busy vacay schedule, I didn't register for any classes prior to the conference; and of course, most were sold out, so I only attended the vendor and quilt show with my not-too-excited husband in tow. 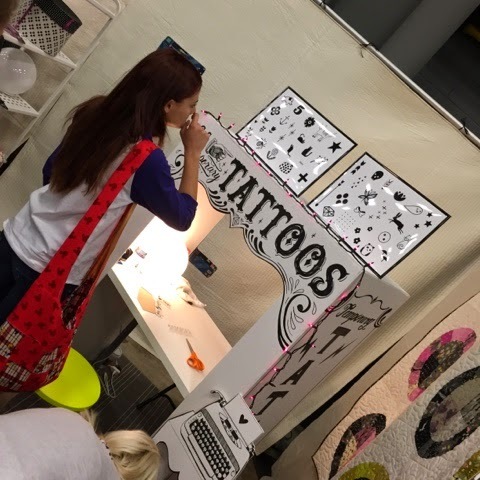 You could get both real and fake tattoos at different booths at QuiltCon. I elected to carry my fake tattoos out in my bag - might save them for some retreat fun later. I tested my Kona IQ. 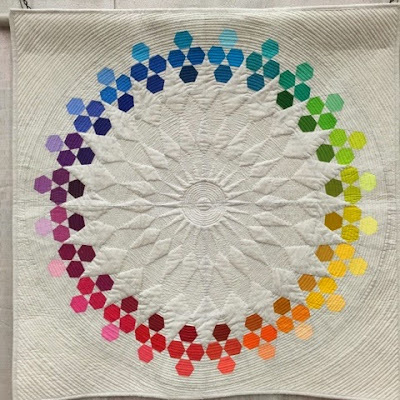 I think I failed - but I learned what the color 'Thistle" looks like (might come in handy some time here at Thistle Thicket Studio). 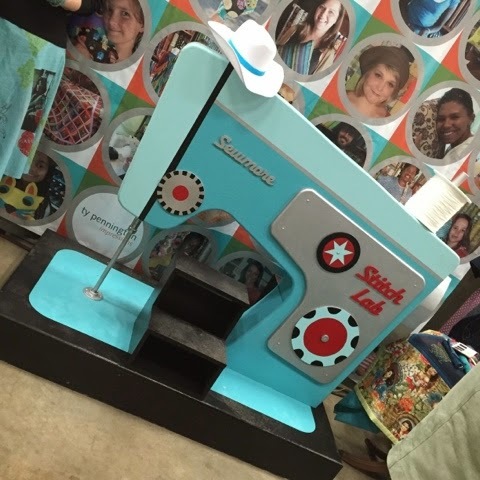 And no, I didn't ride the bucking sewing machine in the Stitch Lab booth. Only in Austin, Texas! 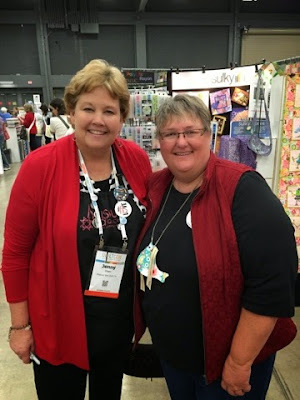 I got to meet Jenny Doan of Missouri Star Quilt Company fame. She's just as down-to-earth as you would expect. And I ran into fellow Kansan Lynne Hagmeier of Kansas Troubles and we chatted for awhile before she gave a presentation. Wished I'd remembered to snap a pic! Whether it was self-expression through self-portraits or capturing emotion through facial expression or body position, portraits were popular. 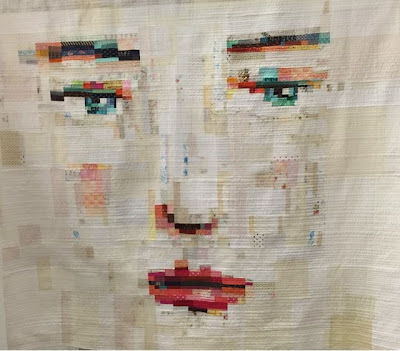 Face #1 by Melissa Averinos, West Barnstable, Massachusetts. 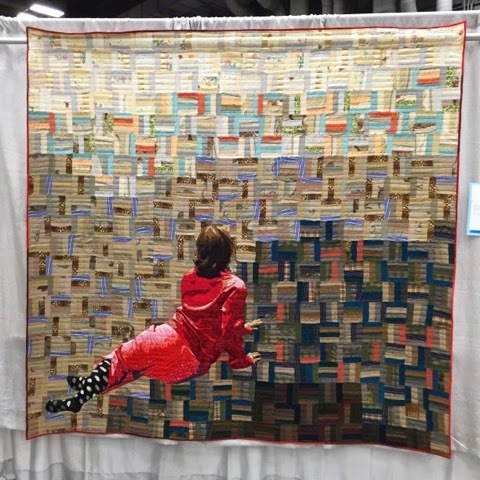 Winner of QuiltCon's Judges Choice Award. 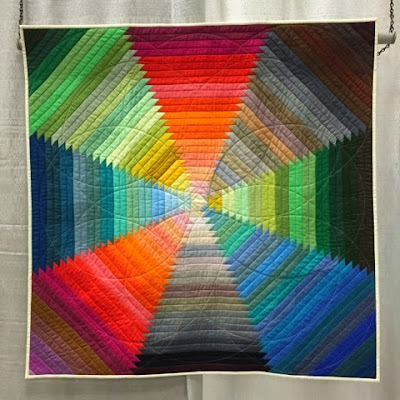 Quilted by Suzanne Whiteside. (The American Context #16) Christina's World by Luke Haynes, Los Angeles, California. Typography was also popular. 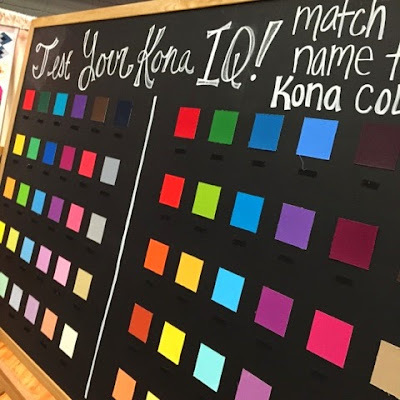 What better way to get your message across - whether it's humor, commentary, or identification. 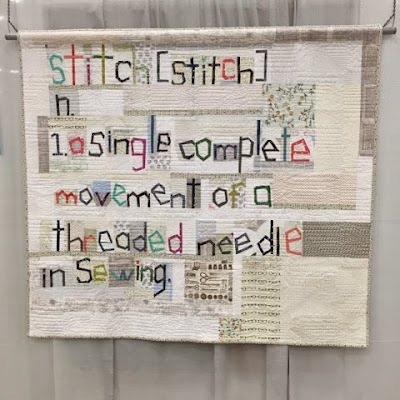 The Definition of Stitch by Sarah Fielke, Chatswood, New South Wales, Australia, Quilted by Kim Bradley. 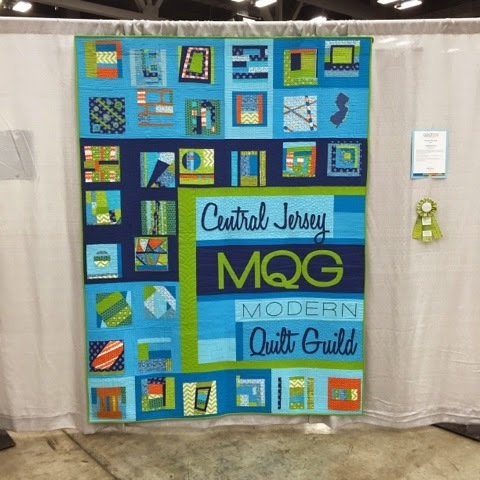 Central Jersey MQG Banner by Members of the Central Jersey Modern Quilt Guild, Phillipsburg, New Jersey, 3rd Place Group Quilts. 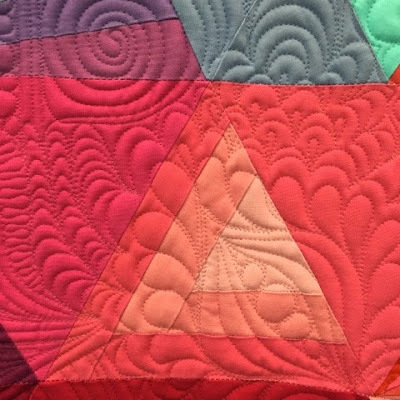 Many modern quilts are defined by their use of negative space. 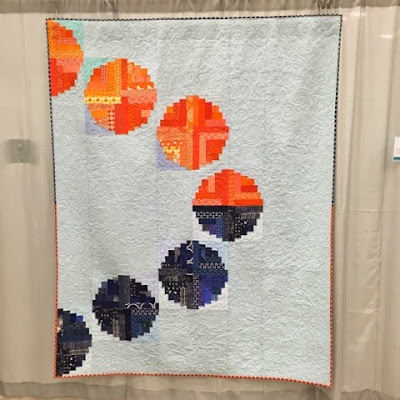 Eclipse by Members of Hope Circle, Bellevue, Kentucky. 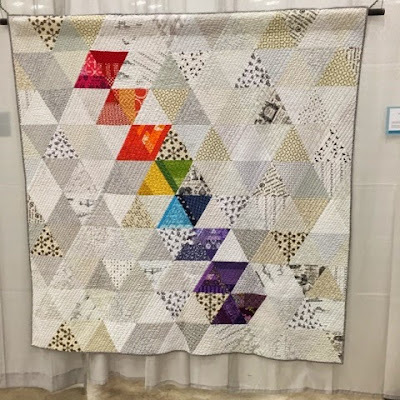 Rainbow Triangles by Kat Drinkwater, Jennifer Ferriss-Salter, Mai Flourry, Briawna Hugh, Lisa McGriff, Dhia Peach, Gabrielle Robles, Kari Stewart, Carla Voorhees, Louise Wackerman, Silver Spring, Maryland, Quilted by Carla Voorhees. Colorado 4x4 by Stephanie Ruyle, Denver, Colorado. Chandelier by Lee Heinrich, Mequon, Wisconsin. Stock on Hand by Katherine Jones, Chigwell, Tasmania, Australia. 2nd Place Bias Tape Challenge. 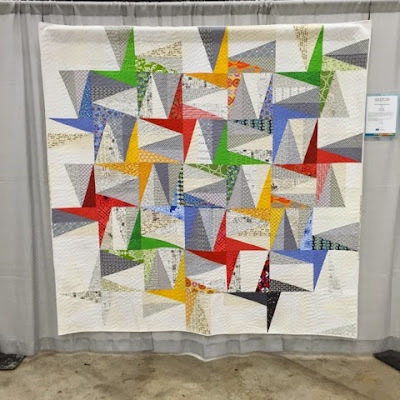 Huckleberry by Rebecca Bryan, Wildwood, Missouri. Feathers by Shannon Page, Dallas, Texas. 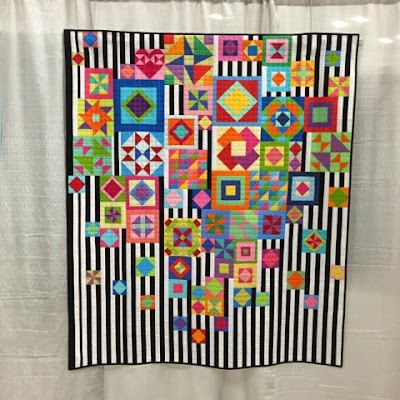 Many of the quilts displayed featured solid, bright fabrics and repeating patterns or random patterns. Tessellation 3 by Nydia Kehnle, Monroe, New York. Here's a close-up of the quilting on the Tessellation quilt. 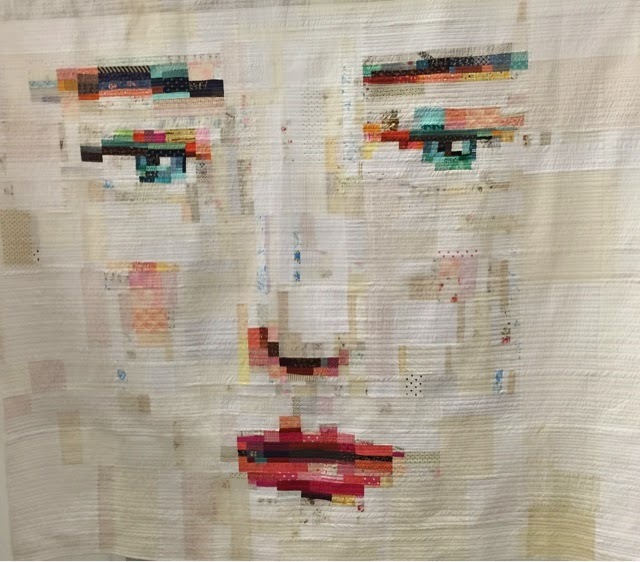 Wish I had taken more photos of the quilting on these quilts, some were amazing! Bauble by Emily Cier, Seattle, Washington. Score For Bias Strip Petals: Daisy by Sherri Lynn Wood, Oakland, California. Gypsy Wife by Catherine Mosely, Cameron Park, New South Wales, Australia. 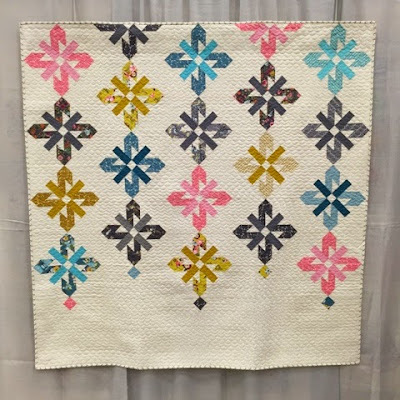 Pattern by Jen Kingwell. Wavelength by Lee Heinrich, Mequon, Wisconsin. Grand Pineapple - Dichotomy by Allison Lee, Raleigh, North Carolina. Rail Fence, from the collection of Bill Volckening, Maker Unknown. 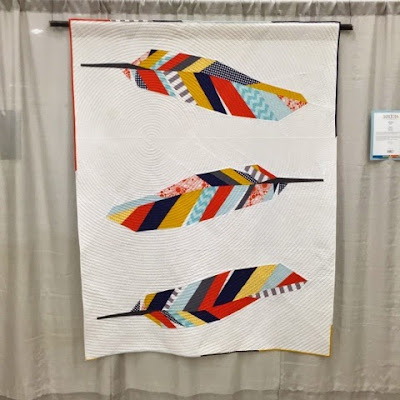 What do you consider modern quilting to be? Do you consider yourself a modern quilter? 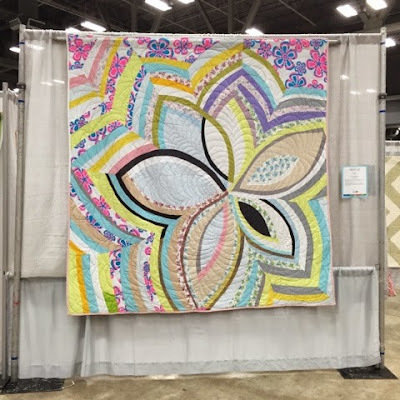 Well, whether you do or don't, if you are a quilter, you'll enjoy QuiltCon! I did. 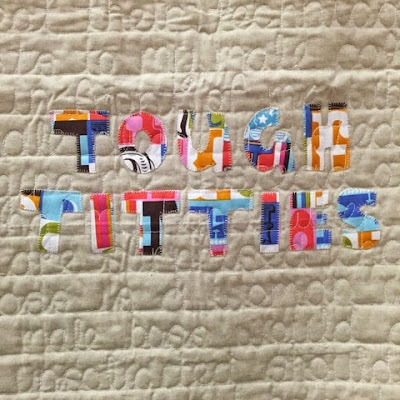 I make both kinds of quilts, I think. 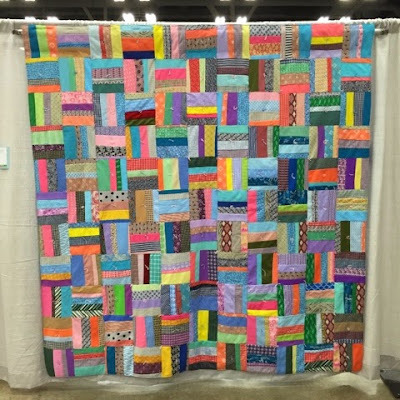 I really enjoyed Quiltcon and thought it was quite interesting the range of ages of the attendees and the number of men at the show.